Disney Book Group is partnering with me for a giveaway! 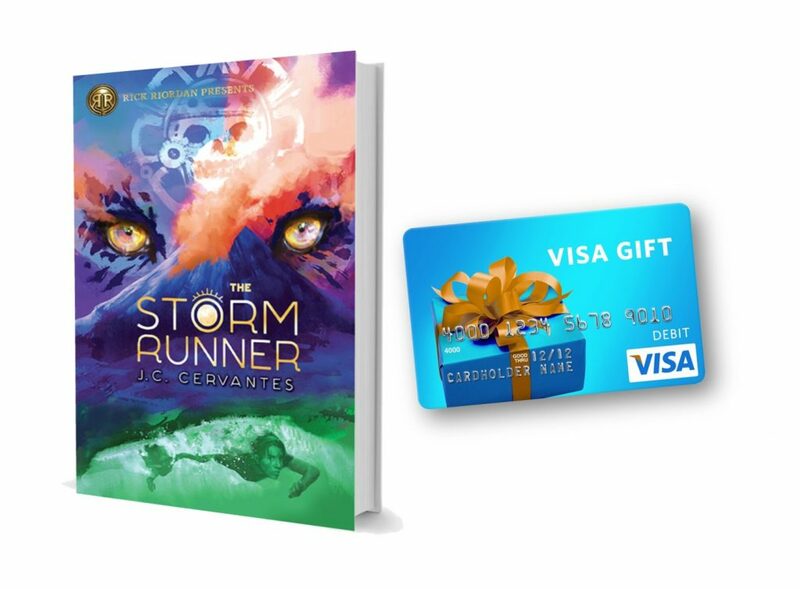 One lucky About A Mom reader will win a copy of an exciting new middle grade book titled The Storm Runner by J.C Cervantes, plus a $100 Visa gift card for a purchase of mythical proportions. How fun is that? 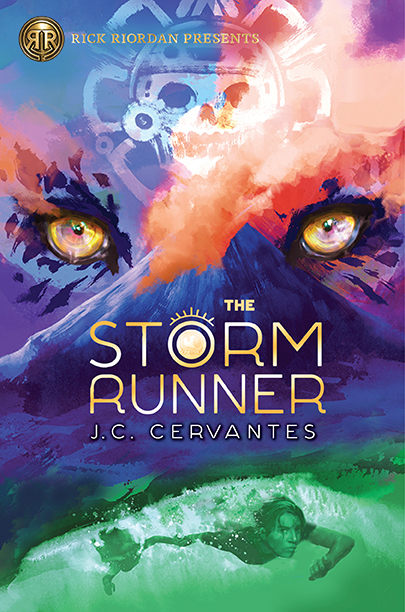 A Storm Runner Novel, Book 1 by J.C. Cervantes is published by Rick Riordan Presents, an imprint of Disney Book Group. This brand new book recommended for ages 10-14 is in stores now. 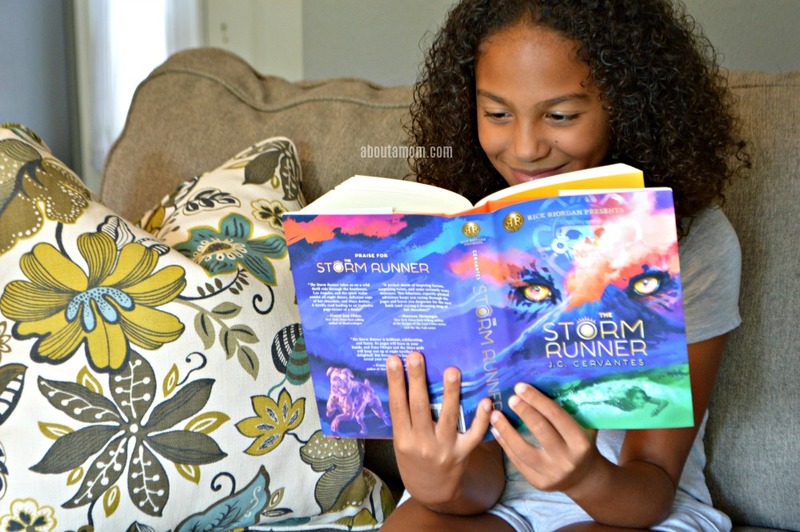 I’m currently reading The Storm Runner with my 10-year old daughter, and it’s a real page turner filled with adventure, friendship, mystical creatures and a fun take on Maya mythology. Zane is a little different from other kids, and struggles to fit in. Things really turn around for him when he makes a mysterious new shape-shifting friend, Brooks, who is there to help him fulfill his destiny in a great prophecy. The two set off on a race against time to save the world, and along the way meet up with some interesting characters. I love a good “chosen one” story and am looking forward to getting to the end of this story very soon. So far, we are really enjoying this book and are already looking forward to the next installment. Learn more about the book at ReadRiordan.com. Order a copy of The Storm Runner on Amazon. I have a 13 year old daughter and a 9 year old son. I think this book would be a good one to read out loud to the both of them. This looks like such a good book. I’ve nothing but good things about Storm Runner. I’m thinking about buddy reading this book with my daughter. And how gorgeous is that cover?!! This book sounds like a great read for my kids. My son is 38 and has mild autism and loves to read books. This sounds like one of those series we will be seeing turned into huge hit movies in a short time! My niece would love this book. I’m thinking the same thing as we read this, Tamra! I can totally see novel becoming a movie. My daughter saw this on line the other day and got really excited. She has really taken an interest in mythology as she says there is always really “cool” stuff to the characters. She can not wait to read it. My grandchild would love to read the exciting new middle grade book titled The Storm Runner by J.C Cervantes. I love the art work of the front cover! Gorgeous! This sounds like a book my daughter would love to read (she’s 10 too!)! She loves Disney Hyperion books! My grandchild would enjoy this book! The book sounds so great, seems like it would really keep a kids attention. I have a niece who would read this. My kids love reading and this book would be awesome to read. I know just the person who would love to be gifted this book. My son is 38 but has the mind of a teenager (autism) and I think he would love this book. Looks like an interesting book. I think my daughter would enjoy it. Thank you for awesome chance! My daughter would love this. This book looks so interesting. I think I would read it myself. The book sounds like a winner. I love the cover. It really helped to peak my interest. I really love the cover of this book. The eyes over the mountain is such a compelling image. This would be a blessing. I love your blog! The Storm runner sounds awesome – I am really looking forward to reading it!!! The book really does look amazing. I would love to read it. The book looks charming. My niece is 11, I’m sure she would love this book. Wow this sounds like a really cool read. I love the cover art as well. This is a great book for adults to read to their children even we as parents and adults can enjoy reading this and benefit with good times with our kids! I love books that get kids excited about reading. Looks like a fun book. My nephew would really love to read this. My nephew would really enjoy this book. I think the cover looks great! I would love to win this awesome prize pack for them!